The senses of taste and smell are related because they use the same types of receptors and are stimulated by molecules in solutions or air. Humans can taste sweet, sour, bitter, salty, and umami; umami is the savoriness of certain foods that are commonly high in protein. Odors come from molecules in the air that stimulate receptors in the nose; if an organism does not have a receptor for that particular odor molecule, for that organism, the odor has no smell. The senses of smell and taste are directly related because they both use the same types of receptors. If one’s sense of smell is not functional, then the sense of taste will also not function because of the relationship of the receptors. Uniform Distribution of Taste Receptors: Humans detect taste using receptors called taste buds. Each of these receptors is specially adapted to determine one type of taste sensation. Recent evidence suggests that taste receptors are uniformly distributed across the tongue; thus, the traditional tongue map is no longer valid. Both taste and odor stimuli are molecules taken in from the environment. The primary tastes detected by humans are sweet, sour, bitter, salty, and umami. The first four tastes need little explanation. The identification of umami as a fundamental taste occurred fairly recently. It was identified in 1908 by Japanese scientist Kikunae Ikeda while he worked with seaweed broth, but it was not widely accepted as a taste that could be physiologically distinguished until many years later. The taste of umami, also known as savoriness, is attributable to the taste of the amino acid L-glutamate. In fact, monosodium glutamate, or MSG, is often used in cooking to enhance the savory taste of certain foods. The adaptive value of being able to distinguish umami is that savory substances tend to be high in protein. All odors that we perceive are molecules in the air we breathe. If a substance does not release molecules into the air from its surface, it has no smell. If a human or other animal does not have a receptor that recognizes a specific molecule, then that molecule has no smell. Humans have about 350 olfactory receptor subtypes that work in various combinations to allow us to sense about 10,000 different odors. Compare that to mice, for example, which have about 1,300 olfactory receptor types and, therefore, probably sense many more odors. Uniform distribution of taste receptors (the myth of the tongue map): Humans detect taste using receptors called taste buds. Each of these receptors is specially adapted to determine one type of taste sensation. Recent evidence suggests that taste receptors are uniformly distributed across the tongue; thus, this traditional tongue map is no longer valid. The senses of smell and taste combine at the back of the throat. When you taste something before you smell it, the smell lingers internally up to the nose causing you to smell it. Both smell and taste use chemoreceptors, which essentially means they are both sensing the chemical environment. This chemoreception in regards to taste, occurs via the presence of specialized taste receptors within the mouth that are referred to as taste cells and are bundled together to form taste buds. These taste buds, located in papillae which are found across the tongue, are specific for the five modalities: salt, sweet, sour, bitter and umami. These receptors are activated when their specific stimulus (i.e. sweet or salt molecules) is present and signals to the brain. In addition to the activation of the taste receptors, there are similar receptors within the nose that coordinates with activation of the taste receptors. When you eat something, you can tell the difference between sweet and bitter. It is the sense of smell that is used to distinguish the difference. Although humans commonly distinguish taste as one sense and smell as another, they work together to create the perception of flavor. A person’s perception of flavor is reduced if he or she has congested nasal passages. Odorants and tastants produce signal molecules received by receptors, which are then processed by the brain to identify smells and tastes. Odorants are received by receptors in the nose, which send signals to the olfactory bulb of the brain to create an appropriate response; humans have about 12 million receptors. Taste results when molecules are dissolved in fluid and reach the gustatory receptors on the tongue; the signals are sent to the brain to determine which flavor (bitter, sour, sweet, salty, umami ) is being consumed. Taste buds are found on the tongue and contain clusters of gustatory receptors on bumps called papillae; fungiform papillae each contain one to eight taste buds; they also have receptors for pressure and temperature. The ability to smell and taste declines with age. Odorants (odor molecules) enter the nose and dissolve in the olfactory epithelium, the mucosa at the back of the nasal cavity. The olfactory epithelium is a collection of specialized olfactory receptors in the back of the nasal cavity that spans an area about 5 cm2 in humans. Recall that sensory cells are neurons. An olfactory receptor, which is a dendrite of a specialized neuron, responds when it binds certain molecules inhaled from the environment by sending impulses directly to the olfactory bulb of the brain. Humans have about 12 million olfactory receptors distributed among hundreds of different receptor types that respond to different odors. Twelve million seems like a large number of receptors, but compare that to other animals: rabbits have about 100 million, most dogs have about 1 billion, and bloodhounds (dogs selectively bred for their sense of smell) have about 4 billion. 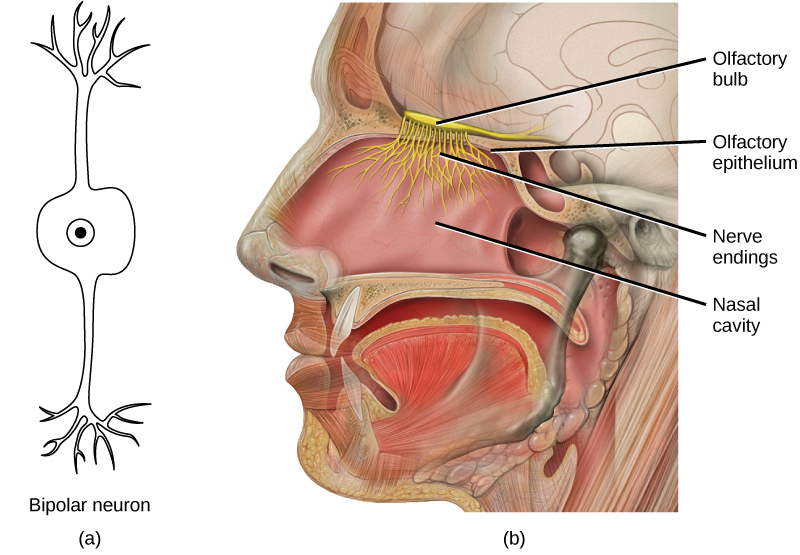 Human olfactory system: In the human olfactory system, (a) bipolar olfactory neurons extend from (b) the olfactory epithelium, where olfactory receptors are located, to the olfactory bulb. Olfactory neurons are bipolar neurons (neurons with two processes from the cell body). Each neuron has a single dendrite buried in the olfactory epithelium; extending from this dendrite are 5 to 20 receptor-laden, hair-like cilia that trap odorant molecules. The sensory receptors on the cilia are proteins. It is the variations in their amino acid chains that make the receptors sensitive to different odorants. Each olfactory sensory neuron has only one type of receptor on its cilia. The receptors are specialized to detect specific odorants, so the bipolar neurons themselves are specialized. When an odorant binds with a receptor that recognizes it, the sensory neuron associated with the receptor is stimulated. Olfactory stimulation is the only sensory information that directly reaches the cerebral cortex, whereas other sensations are relayed through the thalamus. Detecting a taste (gustation) is fairly similar to detecting an odor (olfaction), given that both taste and smell rely on chemical receptors being stimulated by certain molecules. The primary organ of taste is the taste bud. A taste bud is a cluster of gustatory receptors (taste cells) that are located within the bumps on the tongue called papillae (singular: papilla). There are several structurally-distinct papillae. Filiform papillae, which are located across the tongue, are tactile, providing friction that helps the tongue move substances; they contain no taste cells. In contrast, fungiform papillae, which are located mainly on the anterior two-thirds of the tongue, each contain one to eight taste buds; they also have receptors for pressure and temperature. The large circumvallate papillae contain up to 100 taste buds and form a V near the posterior margin of the tongue. Taste buds: (a) Foliate, circumvallate, and fungiform papillae are located on different regions of the tongue. (b) Foliate papillae are prominent protrusions on this light micrograph. In humans, there are five primary tastes; each taste has only one corresponding type of receptor. Thus, like olfaction, each receptor is specific to its stimulus ( tastant ). Transduction of the five tastes happens through different mechanisms that reflect the molecular composition of the tastant. A salty tastant (containing NaCl) provides the sodium ions (Na+) that enter the taste neurons, exciting them directly. Sour tastants are acids which belong to the thermoreceptor protein family. Binding of an acid or other sour-tasting molecule triggers a change in the ion channel which increases hydrogen ion (H+) concentrations in the taste neurons; thus, depolarizing them. Sweet, bitter, and umami tastants require a G-protein-coupled receptor. These tastants bind to their respective receptors, thereby exciting the specialized neurons associated with them.